The interwebz is a wonderful place. Hang out in enough whisky-themed places (Connosr, Instagram, Facebook) and you start to develop a nice little network. Thus far, I feel like I’ve received far more than I’ve put out into the whisky-verse, but I’m always trying to balance out that equation as best I can. This sample came my way from a Facebook friend and fellow Laphroaigophile who has helped me acquire several hard to get (for me) bottles. I remain in his debt. I believe this is a travel retail exclusive, but I could be wrong. Nose(undiluted): damp peat, dark fruit (raisins, dates), a hint of cinnamon, some iodine, brine, and a the medicinal/antiseptic note that Laphroaig is known for. With water, there's a mineral note that comes out on the nose, like pencil lead. The fruit becomes a bit brighter, with lemons joining the raisins and dates. The palate and finish are almost unchanged with water, there is a slight re-ordering of the flavours, with the smoke being a bit more prominent, but otherwise it stays the same. Add water or don't, it doesn't seem to change much. This feels like a “summer Laphroaig”, almost like what Select could have been, had they bottled it at a more respectable strength. It’s a bit fruitier and not quite as smoky and medicinal as I want it to be, but it’s pleasant nonetheless. I won’t try to hunt down a bottle, but I would certainly purchase one if I came across it at a reasonable price. Nice review. I don't think it is possible or wise for a casual Islay sipper to track down every expression, but having read your review I would more likely than not accept a dram if offered. "Add water or don't, it doesn't seem to change much." Sweet! Then your free tab water can be immediately transformed into expensive Laphroaig. Nose: The nose is predominantly iodine, tar, vanilla, and smoke. After a few minutes you pick up the sherry, but it's very faint. It adds just a slight sweetness because there's really no way to mask the strong tar and smoke notes. Taste: A syrupy concoction that arrives sweet and then gives way to ash, iodine, smoke, charred wood, and tar. It has a really nice, minimally spicy, mouth feel with low heat. It's rather smooth, composed, and refined for a Laphroaig. It's just rich and precise without much pomp. The balance seems perfect. I tend to enjoy just holding this one in the mouth. Finish: Charred wood, vanilla, iodine, smoke, spicy peat, all followed by a slight nuttiness. A word of caution. When I first opened this bottle, the taste was rather chemical. By this I mean it tasted rather hot and sulphury. As the bottle level has gone down to the half-way mark, the profit has changed for the better. This Laffie is triple cask matured, meaning that it matured on bourbon casks, quarter casks and PX casks. Why they call this simply PX Cask is beyond me, but there you have it. For a few years it was only available in the duty free (it is a one liter bottle), but nowadays you can simply order it online. The nose is sweet on citrus, smoked ham, aspartaam, diesel oil and quite herbal (think camphor, thym and majoram). The ashes and smoke are quite discrete, to be honest. Red fruit appears, albeit in a stew. But the sweetness is somewhat chemical, which does not make me happy. I would have loved some more body as well. It starts quite tannic on oak wood and bakery spices, before some peat, burnt wood and caramel enter into the fray, side by side with the sweet fruit like strawberry, grapefruit and blackberries. It is a bit like a basket of red fruit simmering on the BBQ with a good dose of BBQ sauce on top. In the rather short finish, it quickly turns bitter and dry. I do get some red fruit and chocolate. Not bad, but far from my favorite Laffie. I had rather spent that 65 EUR on something else. @markjedi1 Wildly differing views on this one. I've been tempted a few times but always passed it over after seeing too many luke warm reviews. Thanks for the review. I really enjoyed my last NAS Laphroaig, the Triple Wood. Maybe I’m on a roll here. This one’s called “Laphroaig PX.” It’s a travel retail release that has spent time in PX, bourbon, and quarter casks. Nose: A particularly sweet Laphroaig profile. It’s on the smooth side, with red fruits, sherry, cherry tobacco, berries, oak, peat, and tarmac. Inviting. Palate: Rich, with a slightly thick mouthfeel. Very woody. Big sherry, sweet berries, tarmac, salt, cherrywood, pickles. Finish: Cherry tobacco, leather armchair, glazed ham, tarmac, peat, oysters, oak. Medium-long finish and sweet, with a decent interplay of flavours. Thoughts: This may be the most approachable Laphroaig I’ve had. It’s balanced, sweet, and has loads of fruit. Good sherry/peat integration, too. But it’s not what I’d call “inspired.” With all the jumping between barrels this whisky did, the end result isn’t as characterful as I’d hoped. And the oak, while potent and enjoyable, isn’t as integrated as it should be. One could argue that this is more refined, but I like Laphroaig more when it’s got teeth. It’s not a bad dram at all, but it’s too “pleasant” for me, and it’s overpriced. @Alexsweden, actually you and your guest may not be disappointed when you finally do open it. Like I said, it’s a nice whisky. Just not “big” by Laphroaig’s standards, that’s all. @Frost, agreed. Hardly the best Laphroaig. Also, for its quality it’s well over-priced here in Taiwan. Nice review. I have this one unopened in my cabinet and I'm trying to hold of it, saving the tasting for a special occasion or guest. It sounds very inviting but I can relate to what you're thinking about the kick in it. I too like a whisky with lots of character. Picked this one up at Schiphol airport on my way to the wild city of Naples, Italy. I wrongly had low hopes to find a decent shop over there so I felt I had to visit the duty free area. This travel retail exclusive Laphroaig luckily was available at a 25% discount:) €70,- for a liter sounded great to me so I grabbed it immediately. Nose: a wall of thick wet medicinal smoke, burning resin and enormous oak greet you at first, but with a bit of water and a few minutes I also get forest earth, sea breeze, winter spices(laurel, cloves), blackcurrants, strawberries and very buttery vanilla custard cake. This is a gargantuan and luscious nose. Unmistakably Laphroaig, but with added fruity and spicy notes. Palate: It starts mellow and sweet, but soon builds up into an eruption of flavors arleady mentioned in the nose towards a drier finale. Dont be mistaken, its very peaty, but there is much more to discover behind the smoke curtains. Like those deliscious smoked hams, moccha coffee and fresh herbal notes. It all comes in a nice oily texture with rounded flavors in a big and full body. Great decicion to bottle it at 48% Its quite wild and stormy too, it keeps delivering different flavors but it also manages to stay pretty balanced. If you're familiar with Laphroaig, you can easily detect which flavors belong to which cask. And its sweet, but not overly. Less than expected for sure, which was a big relief. Finish. Its endless... even after 20 minutes the flavors still dwell. big peat smoke, dry oak, roasted nuts and also a lot of the red fruit notes linger on. Wow one of the best Laphroaig expressions I had so far. The fresh PX casks really deliver and give the already strong Laphroaig core profile a brilliant addition. Ofcourse its not as complex as the 18yr old, but the flavors are big and tasty. It shurely beats the crap out of some other expressions of late. Happy hunting! @Robert99 Thanx:) Well, its a NAS Laphroaig bottled at 48%, so it can't be all that gentle and mellow :) When you just open the bottle, the spirit is still a bit cranky and tart, but after a few weeks open the roughest edges subside and make way for huge beefy flavors. Its bigger and bolder than the 10, and deeper/more complex than the QC so in my opinion, Laphroaig fans and adventurers can't go wrong. For real roughness, try the Lagavulin 12, its quite brutal and not elegant at all. @PeatyZealot Yummy! Great review. I like my Laphroaig to be dirty, almost vulgar. When I am looking for an elegant Islay, I go to Lagavulin. I am not saying that one is better than the other, just that, for me, some roughness serve very well Laphroaig. So that leads to this question: how rough is this PX cask? Pedro Ximenez cask aging does an excellent job of adding a level of complexity to the drink and rounding off the classic peaty/smoky islay foundations. The sweetness and aroma of the sherry casks is clearly evident but not overpowering. A very smooth drink overall with no noticeable harsh notes. Highly recommended! Laphroaig PX takes it's name from the Pedro Ximenez sherry casks it is finished in. The PX casks are the final of three different casks used. The three types of barrels used in the maturation each impart a different character whilst still retaining that distinctive Laphroaig character. First is American oak, followed by Quarter Cask and finally 12 months in Pedro Ximenez sherry casks. The last maturation in ex-PX Cask is a first for Laphroaig but hopefully not the last. Nose. Big, salty, sweet vanilla, cherries, peat, smoke and dry sherried fruits. Palate. Big smoke, peat, tangy sweet spiced vanilla. The sherry is there but not as much as on the nose. Sea salt still there. Finish. The sherry comes back again, oily and sticky sweetness. The peat, salt and smoke compliment oak with a peppery bite. Long sherried finish. Unmistakably Laphroaig. I really like it and consider it worthy of the hype. It's not quite a well mad east he Cuan An Mor but the sweet sherry and dryness are different and well balanced. Laphroaig distillery (the name means "the beautiful hollow by the broad bay") was established in 1815, by Alex and Donald Johnston. It was sold to Long John International in the 1960ies and subsequently became part of Allied Domecq. Today the distillery is owned by the American spirits company Beam Inc. and therefore, now, ultimately by Suntory. ‘PX Cask’ was released in 2012 and is an exclusive travel retail expression. Just like the ‘Triple Wood’ it has enjoyed a triple maturation in three types of cask: the first maturation is in ex-bourbon barrels, the second one in quarter casks, followed by the final maturation in large European oak ‘PX’ casks that originally contained Pedro Ximénez sherry. The nose is rich and smoky. Distinct vanilla flavours go together with lemon biscuit and raisins. Next there follow hints of oranges and rubber (in a good way). All in all the smoke is quite soft and decent, and medicinal flavours are all but absent. The palate is full-bodied and a tad spicy. Vanilla and oranges take center stage, accompanied by subdued smoke. There is also a touch of tobacco and some leather, quite noble really. Tarry and sweet at the same time, this is a rather luscious palate. The finish is long and warming, both sweet and nicely smoky. Towards the end it gets more and more peppery. This was an astonishingly yummy Laphroaig! While there was hardly any medicinal influence, very soft smoke was omnipresent, and both nose and palate were pleasantly sweet. It might be an unusual Laphroaig, but it certainly worked for me, although with this type of cask management I prefer the ‘Triple Wood’. Thanks, @vanPelt. There was really nothing wrong with the PX Cask. 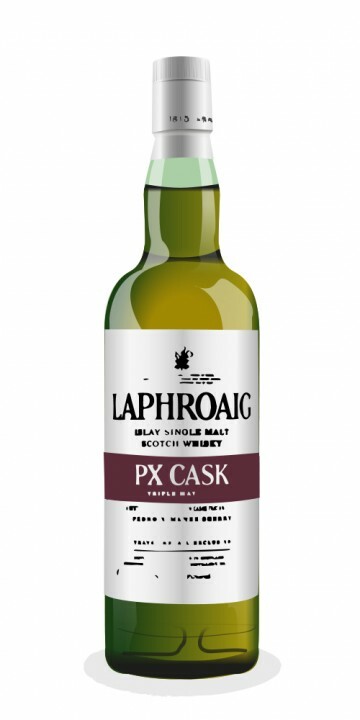 I simply prefer the smokier and more phenolic Laphroaig expressions, and PX Cask did not tick those boxes. Let's say that it did not have the 'phenolic complexity' that I look for in Laphroaig. That was better solved in the case of the Triple Wood, in my humble opinion. Thanks for the good review! I find it quite accurate, as I plan a write-up of my own. For something astonishingly yummy, I'm wondering: where did it lose points, for you? Also, have you noticed the bottle changing with time? Whiff of sherry on the nose, but more offshore aromas. Dead fish. Sherry aromas fades quickly. Crisp light start, with a kicker of a finish. Burns hot and turns smokey and green at the end. No sherry whatsoever. Touch of water and the nose becomes tar-like. Still light and fresh start and now the finish smooths out the finish. Some smoke, but a rich salted pork flavour. Very complex, or maybe crazy. Take a typical Laphroaig (like the 10), pour it over a chocolate rum cake, soak it over night and say 'Hello' to the Laphroaig PX Cask! The nose is quintessential Laphroaig with that familiar seaweed, iodine and peat mixture. But that's where the similarity ends. Because from within salty seas comes through the most decadent of dark chocolate cakes smothered in ripe bananas, charred citrus and burnt treacle. Finally mossy undertones remind you that you're being enveloped by the open seas and wet skies of Islay. Quite magnificent, actually. The full bodied, juicy palate is dark chocolate and maple syrup with a healthy drop of dry fruits, cinnamon and a touch of clove. Burnt citrus re-emerges to add to the complexity followed by a strange spoonful of yoghurt found in a musty drawer. The oily long finish is lovely and leaves you salivated for hours on end with fennel and banana bread. This is a malt where you finish an evening with because you don't want anything polluting the gloriousness in your mouth. Damn I missed out on this in duty free yesterday , wish i read your review while in store. After the success of the Triple wood , and it’s migration to the general retail sector from travel retail, Laphraoig introduces another retail exclusive this time finished in PX sherry casks rather the Oloroso casks (as in the triple wood). PX being a much thicker and sweeter sherry, is sure to impart sweeter notes to the liquid. The triple wood was nice, but i had higher expectations for this one, even more after meeting John Campbell , distillery manager at Heathrow airport, after we both landed from Glasgow coming from Islay earlier this month. He was flying to the US to make some whisky there, and I returning from a trip to Jura. I asked him about this new expression, and he said it was very different and that it was a cracker. On the way home I forgot to pick a bottle of this (I am forgetful, I know), and was very happy to have a friend and member of the Whisky Israel tasting society bring it to one of our club meetings, so we can all share it, and compare it to the triple wood, even when that session dealt with blended malts (We could not resist trying it). Nose: Lots of sherry, On first sniff the peat is not too strong, but after a few minutes in the glass the peat aromas do get more noticeable. Sweet marmalade (prune,Sultana), BBQ, Anise some smoke and Balsamic. Palate: Big on the peat, much more than the nose would suggest.Cough syrup, very sweet, thick, with prune jam, Aniseed, and smoky wood. Finish :Ash, BBQued meat in sweet sauce and prunes. A very good Laphraoig, excellent sherry finish to it, and that PX does the job. It’s what i was looking for in an OB sherried Laphraoig. Its a few levels better than its predecessor the triple wood. If you like Laphroaigs, and don’t mind the sherry (god knows i don’t! ), you should get one. well priced, and at 48% it’s a lovely piece of Islay drammage.